Holders of 9G, 13G, 13A, 9D, 47A2, SRRV, EO 226 Visa – shippers are entitled a full tax exemption; the application for the exemption should be submitted to the Department of Finance. Embassies and diplomatic agencies must apply for any tax exemption from the Department of Foreign Affairs (DFA). Returning Philippine Passport holders are entitled P10, 000 exemptions, on the assessed value, per each family member who stayed abroad for a minimum of 6 months continuously. In excess of this, an import tax at the rate of 50% is charged based on the assessed value determined by the Customs appraiser. Household goods incoming shipments are subject to 100% customs examination, except for diplomatic shipments. For air shipments, Customs clearance with a direct payment of duties takes 2-3 working days from the date of arrival of the shipment. For shipments with tax exemption application, Customs clearance takes approximately 4-5 working days from the receipt of the complete documents from the date of arrival of the shipment (air shipments). For less than container load (LCL) sea shipments, Customs clearance with a direct payment of duties takes approximately 3-4 working days from the transfer of shipments to the Customs bonded warehouse. For LCL sea shipments with a tax exemption application, Customs clearance takes approximately 4-5 working days from the receipt of the complete documents or transfer of shipments to Customs bonded warehouse. 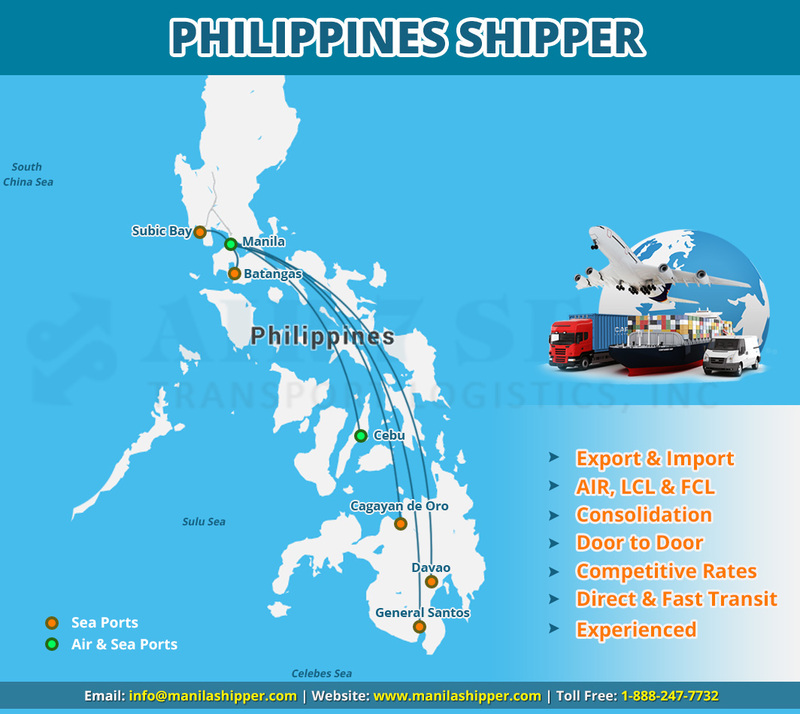 For full container load (FCL) sea shipments, Customs clearance with a direct payment of duties takes approximately 5 working days from the date of arrival of the shipment and 6-7 working days for shipments with a tax exemption application. The Philippines has very specific import procedures on importing motor vehicles and the owner should contact, in advance of loading or exportation, the nearest Philippine Embassy, Consulate, or agent to obtain the most recent information as these rules and procedures change frequently. Duties, ad valorem and value added tax (VAT) for non-Diplomats are assessed up to 90% of the vehicle value. Drugs and medicines, including over-the-counter pharmaceutical and prescription drugs and medicines should be hand carried in minimal amounts. Obscene literature, photographs and films. Note: Customs regulations can change at any time with or without notice. This document is provided as a guide and for information only. While Air7seas has exercised reasonable care in publishing this document, Air7Seas makes no representation, either expressed or implied, as to its accuracy or applicability. Customs Rules in Phillipines about Baggage etc.